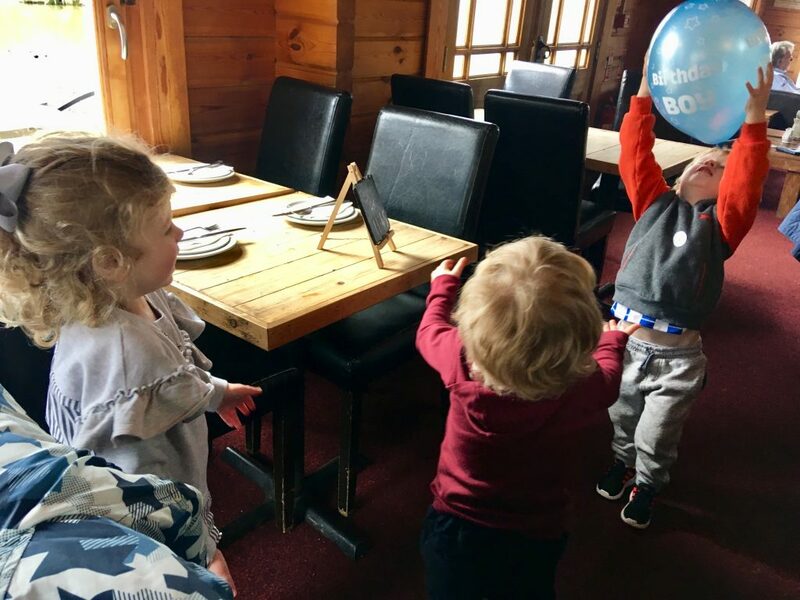 Last Thursday Lucas turned 3 and he was so excited, although he keeps saying his birthday is next week so not sure whether he realises it’s over haha. We had a normal Thursday, where I worked and he went to nursery for a few hours. After nursery we asked him where he wanted to go as he finished at 2. He could choose anywhere and he chose Heskin Hall which is a local farmers market and crafts centre. He loves wandering around there and saying hi to the lady in the spiritual reiki room and buying little food figures from the lady that makes handmade silk scarves! As it was his birthday, we let him buy 2 which he couldn’t believe. I think he got a burger and fries. He doesn’t do anything with them, he just likes to collect little things so they are safely put into his bag. We got a hot chocolate in the cafe and had a nosy around the rest of the place. For tea we went to my parents and had chicken and chips then family cafe round to see Lucas which he loves and we had a little birthday get together for him. 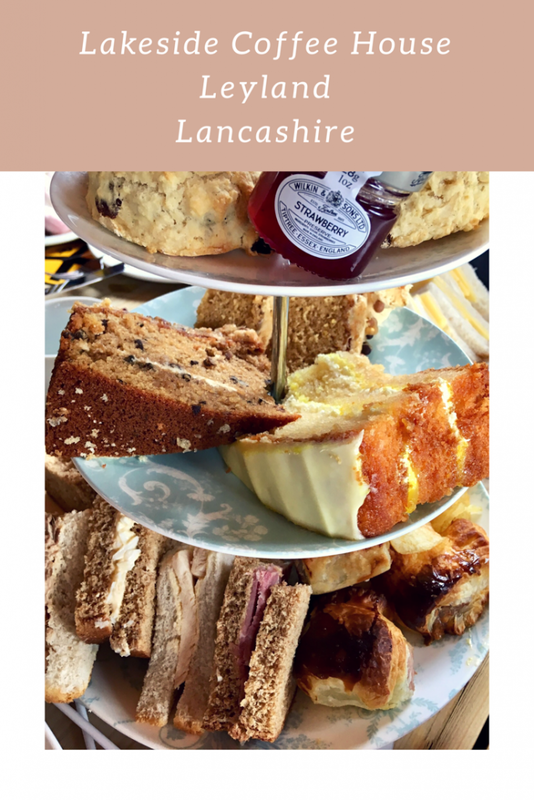 On Saturday, we went to the Lakeside Coffee House at Charnock Farm near Leyland. I met 2 of my friends there from college with their children and we also picked up a friend of Lucas’ on the way. We had their birthday afternoon tea. They ask what theme you want and decorate accordingly. I asked for trains. 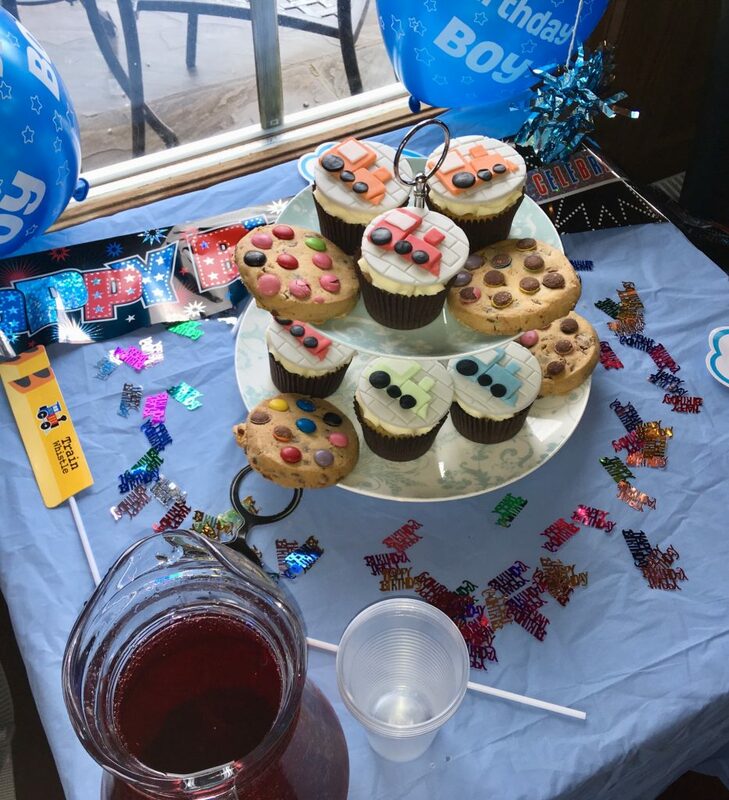 They made train decorated cupcakes and decorated the table with train accessories. 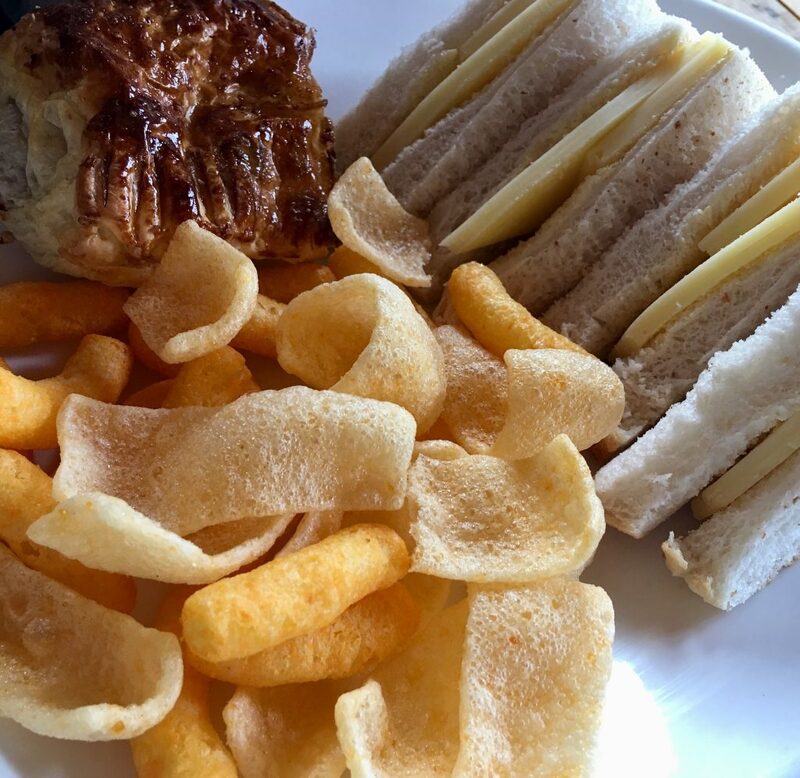 The children were asked what sandwiches they wanted and given individual plates of sandwiches, sausage roll and crisps. They also had a stand of cupcakes and cookies to share afterwards. Myself, Z and K had an afternoon tea stand between us which had sandwiches, sausage rolls, crisps, cakes and scones. The scones where delicious with clotted cream and jam! 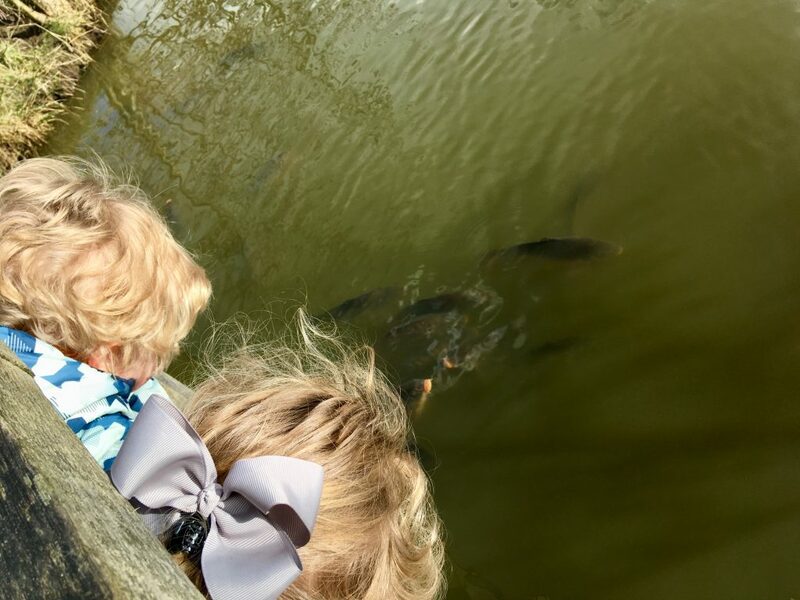 After we finished we went for a walk around the pond where the children could have a little run and looked at the huge fish. There are also animals that you can go and see as well as a gift shop and garden centre. The train cupcakes look great! Its great that they offer that personalised services! Ahh it sounds like the perfect birthday! I love Heskin Hall and Charnock farm! The food there is delicious! Happy Birthday Lucas! How awesome does this look as a little birthday party! All that food looks delicious as well. Happy birthday Lucas! The afternoon tea looks like a lovely way to celebrate. Happy birthday, Lucas! I LOVE birthdays when they’re little. It’s so much more family focused or exploration based. 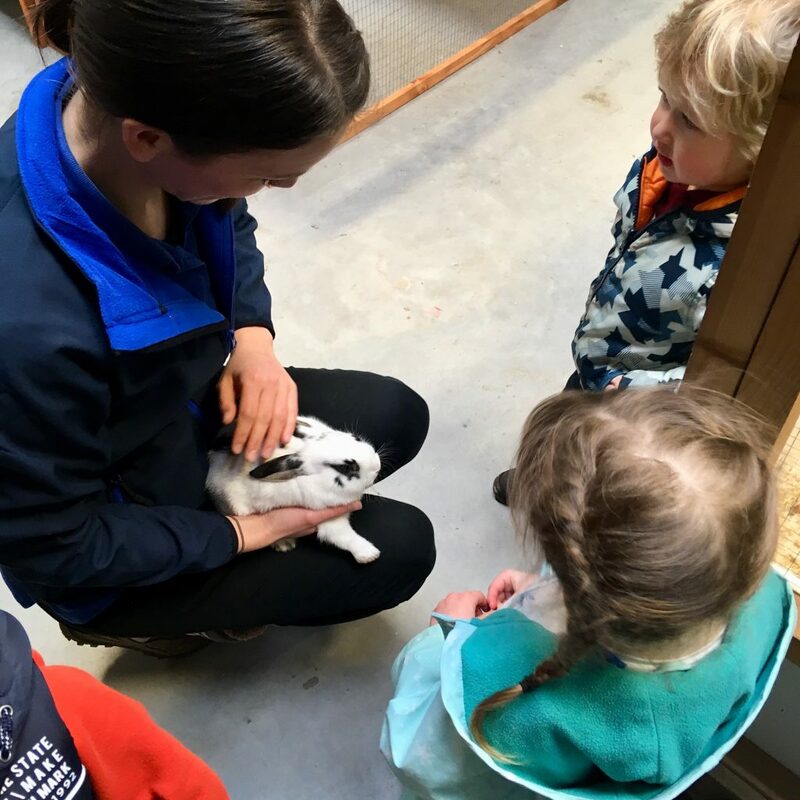 Now Luke is in school as his 5th is coming up, he’s told me he wants big parties with everyone in his class attending…I just want another year where we go to the farm and have hot chocolate and ice creams! Aw!! Those train cupcakes are so adorable and that is such a great idea. i am sure that your son really enjoy his birthday afternoon tea party. Awww Happy Birthday Lucas! It’s crazy how quickly they grow! Happy belated birthday Lucas them train cupcakes are so cute. Looks like a perfect birthday. I love them at this age, everything is so exciting still! What a lovely party and the food looks yummy! I hope he had a great day! It sounds like a fun birthday with lots of cake nad delicious food. Its always nice to spend time with family on birthdays too. Happy Birthday Lucas, looks like you had so much fun eating all the lovely cake and afternoon tea. Enjoy the moment as 3 is such a fab age to be. Awwh, they grow so quickly don’t they. 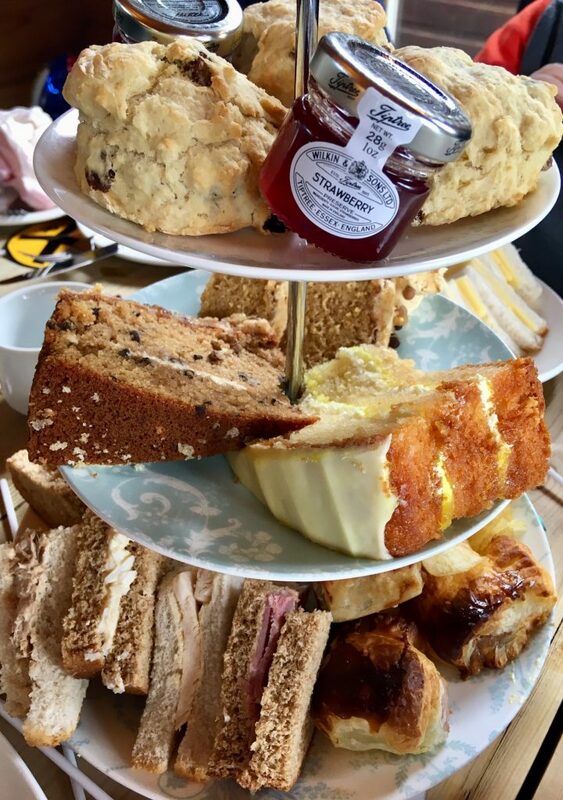 Afternoon tea is the perfect way to celebrate your birthday. They grow so quickly and it sounds like a lovely afternoon tea 🙂 Fabulous.